In the 1940s film Now, Voyager, Bette Davis plays a daughter struggling against her mother's stifling repression. Nearly fifty years later, in the Hollywood saga Postcards from the Edge, Shirley MacLaine, as a neglectful and bossy mother, inflicts untold psychological pain on her daughter, played by Meryl Streep. These dramas of conflict and the ambivalent struggle for separation have been central to popular images of mothers and daughters in the last half-century in the U.S. Walters boldly challenges these dichotomies and proposes an innovative and multilayered understanding of the cultural construction of the mother/daughter relationship. 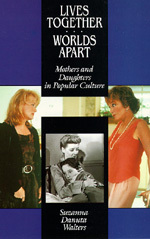 In a discussion of popular media ranging from themes of maternal martyrdom to maternal malevolence, Walters shows that since World War II, mainstream culture has generally represented the mother/daughter relationship as one of never-ending conflict and thus promoted an "ideology of separation" as necessary to the daughter's emancipation and maturity. This ideological move is placed in a social context of the anti-woman backlash of the early post-war period and the renewed anti-feminism of the Reagan and Bush years. Walters uses exceptions to mainstream imagery-films such as A Tree Grows in Brooklyn, television shows like "Maude," novels like The Joy Luck Club-to offer evidence of alternative traditions and paradigms. Timely and vividly argued, Lives Together/Worlds Apart makes a brilliant contribution to discussions of popular culture and feminism. Suzanna Danuta Walters is Assistant Professor of Sociology at Georgetown University. She is currently completing a book on feminist cultural theory.